Lockhouse 49 has been restored and is available for rent from the C&O Canal Trust. Furnished in the 1920's style, the lockhouse depicts the heyday of the canal community at Four Locks. This was a community that, at its peak, included 2 stores, 2 warehouses, a dry dock for boat repair, a school, and post office plus a dozen houses. Lockhouse 6 near Brookmont, Md. Lockhouse 10 near Cabin John, Md. Lockhouse 22 at Pennyfield Lock near Potomac, Md. Lockhouse 25 at Edwards Ferry, Md. Lockhouse 28 at Lander, Md. 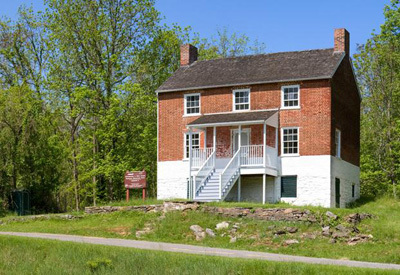 The lockhouses are a few of the more than 1,300 historic structures in the C&O Canal National Historial Park.